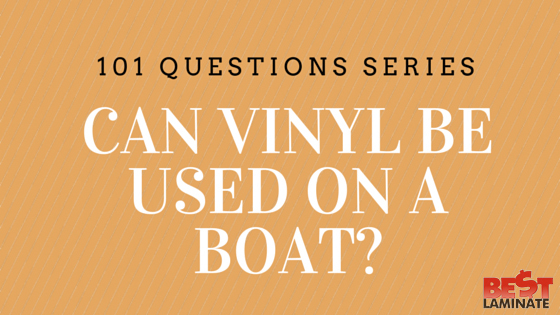 Home >> 101 Questions Series >> Can Vinyl Flooring be Used on a Boat? You finally got around to purchasing that dream boat… or at least a boat. So it was on sale because it needs a little fixing up. No problem! It can be your DIY project to keep you occupied… Until you realize the floor is less that desirable looking. You might ask, Can vinyl flooring be used on a boat? Yes, vinyl flooring can be used on a boat, but only in a room that can be temperature controlled. Meaning, you can install vinyl flooring in the cabin, but you should not install it on the deck. Since luxury vinyl plank flooring is fully water resistant, it is the ideal solution for a boat where moisture is a major issue. In addition, vinyl plank flooring is reusable so if you decide to remodel your boat or get a new one, you can take apart and re-install your flooring as you please. But now comes the hardest part… which vinyl flooring to choose? There are so many options! When choosing a vinyl floor for your boat, the first thing you should look for is durability. Choose a vinyl flooring that has a high wear layer and thickness. The higher the wear layer and the thicker the floor, the better it will perform. Assuming the harsh environment that can be associated with a boat, it is better to invest in a floor that will last for years to come. There are three main different types of vinyl flooring installation methods available. Installation of vinyl plank flooring can either be click and lock, glue down, or loose lay. If you want to be able to pull up your vinyl flooring again to transfer to another boat, or if you’re worried about water seeping under the planks, click and lock planks and loose lay planks are ideal. These two types of installation are the easiest to install and uninstall. If your cabin gets unexpectedly flooded, you can pull up the vinyl flooring and air dries it! Reinstall once the subfloor is dry and it’s like the flooding never occurred! If you don’t plan on ever wanting to pull up your vinyl flooring again, choose a glue down vinyl. If you decide to glue your luxury vinyl plank flooring down, remember to get a waterproof glue. This might be the hardest part because it’s all based on personal preference. We can’t tell you which floor you will like, you will just have to see them for yourself! You can order a free sample of the ones you like and compare! If you would like a timeless look, choose a vinyl flooring that will look good no matter what the boat’s molding or wall colors are. If the lower deck is filled with gorgeous wood paneling, maybe try to switch it up with a contrasting floor color. Stay with the nautical theme and opt for a coastal vinyl flooring. Choose a vinyl that looks a little weather worn or white washed for a gorgeous sea-battered look. Raw looking wood is also a good choice if you want your flooring to look like it was pieced together with driftwood! If you really want to kick it up a notch, opt for a modern looking vinyl. Choose colors that are almost stark white, black, or gray to get a stylish modern look on your boat! Decorate with simplistic colors and geometric designs and you will be amazed at how many people will compliment you. If you would rather have the cool look of stone or tile on your boat, vinyl flooring offers that too! Choose a washed stone look to really add depth and dimension to your desk! Who says you have to stick with a traditional wood look anyway? The maintenance of the vinyl flooring is very simple. Use a broom frequently to remove fine dirt. Depending on how much traffic your flooring endures, use a damp mop once a while to keep your floor clean and fresh. Soap, water, and a mop will bring your vinyl plank flooring back to life in no time. You can easily and affordably transform your boat from basic to beautiful. The glow of a natural looking floor will make your boat feel luxurious and complete, while the 100% moisture resistant core and commercial-grade wear layer will keep you feeling confident that the floor will last for years of boating to come. Vinyl flooring works great in wet areas, heavily tracked in areas, as well as areas of your boat that need a little extra TLC. Order a FREE sample today and see which will look best on your boat! Can vinol be used in outside spaces, like a patios? If not, what material do you recommend me to use? Hand Picked Floors For You! White washed laminate flooring will surely please someone who wants a typical coastal, nautical look. Get inspired today. Relaxing Day at the Beach? Is there anything as relaxing as a day at the beach?